Only about 8 percent of people stick to their New Year's resolution. Food writer Megan Kimble is one of them. Back in January of 2012, the then-26-year-old made a goal to eat only unprocessed foods for a year. 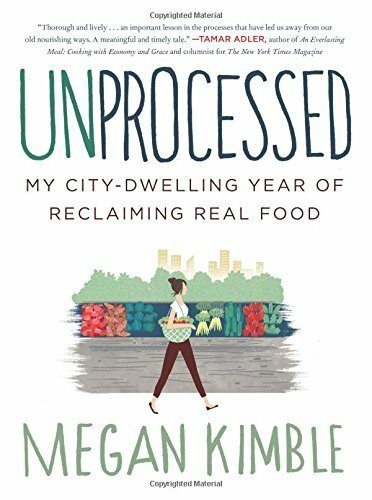 Kimble documented her journey, the lessons she learned and the changes she made in her new book, "Unprocessed: My City-Dwelling Year of Reclaiming Real Food," which helps simplify the challenge of subsisting on a mostly-whole foods diet. Technically, almost all packaged food is considered processed, in the sense that it is made or grown elsewhere and is altered when it reaches the consumer (bagged spinach, for example, or frozen peas). But clearly, there's a major difference between bagged spinach and Spam, or cheese that isn't cheese. For her purposes, Kimble had her own definition for what she considered "unprocessed": anything that she could theoretically make or grow at home fit the bill. The author spoke with The Huffington Post about her 12-month experiment, which was sometimes isolating, mostly gratifying and required a ton of learning. What made you give up processed foods in the first place? It was a convergence of a lot of things. I had been reading and thinking about the environmental impact of our food -- how many fossil fuels it requires to grow and transport food, etc. Also I had been reading Michael Pollan's "Food Rules" and other books talking about how whole foods -- mostly plants -- are best for us. I'd been brewing on all of that for a couple of years and decided to take an unprocessed challenge. Initially, I hadn't made any sort of commitment. But for me, I'm definitely an all-or-nothing kind of person, so I knew I needed to give it a time frame. A year seems like a long time, but not forever. I knew with a year's time, I'd really have to investigate alternatives and see what I could live without. What did your friends and family think of the challenge? Processed is a spectrum. I had a few people be like, "All foods are processed foods so that's silly." This kind of opposition was actually a good thing -- it forced me to greater define my project and find out what I really meant. All food is processed, of course, but there's a difference between cooked vegetables and a bag of chips. I was lucky to have a patient, supportive group of friends. I'd go out to eat and ask a bazillion questions about the menu, and they'd just roll with it. What was your biggest challenge throughout the year? Going out, for sure. There's such a social aspect of food; so much of eating is being with friends and partaking in what others are partaking in. Forever, humans have bonded over the sharing of food. It'd be really hard to meet up with friends, where everyone would be having pizza. It was really hard to be professional and to go to work functions -- you don't want to talk about what you eat with everyone. That was definitely the hardest part. I drank beer and wine. I tried to drink only beers from breweries I could identify. For me, the premise for what I considered unprocessed was theoretically being able to make it at my house. I could have brewed wine or beer at home. I made mead at home. It's basically the lowest-cost alcohol you can make on your own. Part of the bargain of this whole thing was figuring out how to not put my life on hold. I wanted to try my best to make sure the drinks weren't processed, but also wanted to be able to connect with people. Did you have any slip-ups during the course of the year? Of course. I was a single when I started the year and then wanted to start dating. I went out with this guy who sort of ordered food for us in this really macho, annoying way and then food came and I didn't know what to do. It was a sushi roll. White rice is processed, but I decided to make an exception. I immediately regretted it, especially because later in the date I found out that the guy didn't believe that global warming was a real thing. I write about food and the environment so that's kind of a deal breaker. What are you gonna do? When you eat out, it's so hard to know what's in your food. I'd ask so many questions, but at some point you have to move on and hope for the best. What was the first thing you ate when your year was up? A Sonoran hot dog and a Diet Coke. The Diet Coke tasted terrible after a year without soda. It tasted like straight chemicals. Actually, I've totally kicked the soda habit -- it just doesn't taste good to me anymore. I used to eat more snack foods, like packaged cookies, chips and stuff like that. Now that snack food genre stuff doesn't make me feel good or keep me full. That was a nice sort of side effect of the year -- a lot of these processed foods are still kind of invisible to me and my cravings. What was the most surprising thing you learned about processed foods? I started reading ingredient labels on everything I bought. I was shocked to see how many foods have unnecessary processed ingredients. There's sugar in everything. Deli meat has sugar. Mustard, marinara sauce, it all has sugar. The ingredient labels on food are kind of incredible. Once you start reading them its sort of impossible not to. That was sort of shocking to find out: Companies add so much sugar and layers of chemicals to make food last longer and taste better. I'm now an impulsive ingredient reader. What changes did you notice while on your unprocessed diet? I felt full. I felt really full all year. I've dieted on and off my whole life and I'd done the yo-yo diet thing. Eating unprocessed meant that I ate when I was hungry and stopped when I was full and didn't think beyond that. I was really satiated -- I was eating richer, whole foods like butter and yet I didn't gain or lose weight, I just sort of equilibrated. It was really liberating. I didn't start doing this as a diet, but it was a nice side effect to be able to eat whatever I wanted within the confines of unprocessed and feel full and satiated. Did you discover any new favorite foods along your journey? I got into habits. I'll now make big pots of beans or grains at the beginning of the week. It's such a time-saver and way cheaper than buying canned beans or going out to eat. I had to find "shortcut" foods, brands that I knew I could mindlessly buy. Now I have this sense of what brands tend to not put extra things in their food. I have unprocessed radar now. Now that the year's over, what's your diet like? I probably eat 90 percent unprocessed. There will be a meal or two a week that I'm out with friends, and it's really nice to be able to not think about it. But for the most part, a year created a lot of habits that were easy to keep sticking to. What advice can you give to people who want to limit their intake of processed foods? The first and simplest piece of advice I have is to read the ingredient label of everything you buy. When you start looking at what's in your food, you'll start buying things that are better. The next step beyond that is to buy foods without ingredient labels -- oatmeal, bananas, single food items that you can combine yourself at home. Even if you're not much of a cook, you can prepare simple foods at home, like sandwiches, salads and pasta. If you prepare food yourself, you have so much more control over what you're eating. You'll have to spend more time prepping in the beginning, but once you start to find the habits and the things that work for you, it'll start becoming part of a routine and not so time consuming at all.